Harpers Mill’s variety of events and clubs are designed to bring neighbors together. Hundreds of Harpers Mill neighbors have already become friends they now consider family. Many of those friendships started off by meeting at social events and clubs at the central gathering place, Club Park. Harpers Mill homeowners can visit the full calendar of events for the year at www.harpersmillhoa.com. If you have any questions about these events or clubs or if you are a neighbor looking to start a new club please reach out to us at reservations@harpersmill.com. October 4th – Zumba Fitness: Join your neighbor Amy Rudd, Zumba instructor, at the clubhouse on the first three Thursday’s of every month from 6pm-7pm for only $7.00. October 5th – First Fridays: Get together at the Harpers Mill clubhouse on the First Friday of every month from 7pm-9pm for happy hour and fun with your neighbors! This group is for adults only so it is perfect for empty nesters, couples without children, or parents who just want some “me time” with their fellow neighbors! Join the First Fridays Group on Facebook by clicking here. October 8th – Book Club: Join the Harpers Mill Book Club at 7pm at the Clubhouse to discuss Before We Were Yours by Lisa Wingate. Join the Book Club group on Facebook by clicking here. For additional info or questions, please contact Cassie Fiscus at cassiefiscus@gmail.com. October 9th – Free Sign Language Class: Join your neighbor, Ellen Vaughan, for a free sign language class twice a month from 7:00-8:00pm. This class will be held at the clubhouse. For additional info or questions, please contact Ellen Vaughan at eljetslib@gmail.com. Join the Sign Language group on Facebook by clicking here. October 11th – Zumba Fitness: Join your neighbor Amy Rudd, Zumba instructor, at the clubhouse on the first three Thursday’s of every month from 6pm-7pm for only $7.00. October 17th – Bible Club: The Bible Club is hosted by Harpers Mill neighbors, Neil and Donna Wilder, on the 3rd Wednesday of every month. For additional info or questions, please contact Neil Wilder (917-225-3748) or Donna Wilder (917-225-4012). 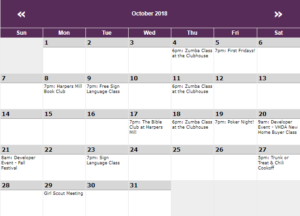 October 18th – Zumba Fitness: Join your neighbor Amy Rudd, Zumba instructor, at the clubhouse on the first three Thursday’s of every month from 6pm-7pm for only $7.00. October 19th – Poker Night! Join the the Poker Club at the clubhouse on the 3rd Friday of every month to play Texas Holdem with your fellow poker players. Guests are welcome. Join the Poker Club group on Facebook by clicking here. October 20th – VHDA New Home Buyer Class: Reach for Your Dreams in VHDA’s Free Homebuyer Class! Are you thinking about buying a home, but not sure where to start? VHDA’s free First-time Homebuyer Class can help. You’ll learn the entire homebuying process from start to finish, and how to stay on track as a responsible homeowner. For questions please contact Yvette Preston at yvette.preston@longandfoster.com. October 21st – Harpers Mill Fall Festival: Join us at Harpers Mill for our third annual Fall Festival. This event is open for the public with activites that include trolley tours to the model homes, live music, face painting, corn pit, horse drawn hayride, free pumpkins and pumpkin painting, food and beer trucks, bounce house, prizes, giveaways and more! Join us at Club Park from 12-4pm. October 23rd – Free Sign Language Class: Join your neighbor, Ellen Vaughan, for a free sign language class twice a month from 7:00-8:00pm. This class will be held at the clubhouse. For additional info or questions, please contact Ellen Vaughan at eljetslib@gmail.com. Join the Sign Language group on Facebook by clicking here. October 27th – Trunk or Treat & Chili Cook-off: Come on out in your Halloween best and enjoy Trunk or Treating and a Chili Cook-Off at the Clubhouse from 6-9pm. Join the event on Facebook for more details by clicking here. © Harpers Mill. All Rights Reserved.